Photo: Lambeth Palace. Used with permission. Suhaila Tarazi is a Palestinian Christian who has lived and worked in Gaza for 40 years. She is the Director of the Ahli Arab Hospital which we support with the help of funding from the Australian Government’s Department of Foreign Affairs and Trade (DFAT). Gaza is often referred to as the world’s largest open-air prison. The vast majority of its 1.8 million people are unable to leave, electricity is limited to about six hours per day, water supply is intermittent, and unemployment is around 40 percent. If that is not enough, the people of Gaza have been subject to three wars in the last decade. To serve the poor and vulnerable in such an environment is a genuine sacrifice. For Suhaila however, it is even more noble because she is one of the fortunate ones who doesn’t have to live in Gaza. She has dual citizenship with another country and could leave if she wanted to. But she chooses to stay because she feels the call of God to serve women with breast cancer at the hospital. We are so happy for Suhaila that she was recently recognised for her long years of service. 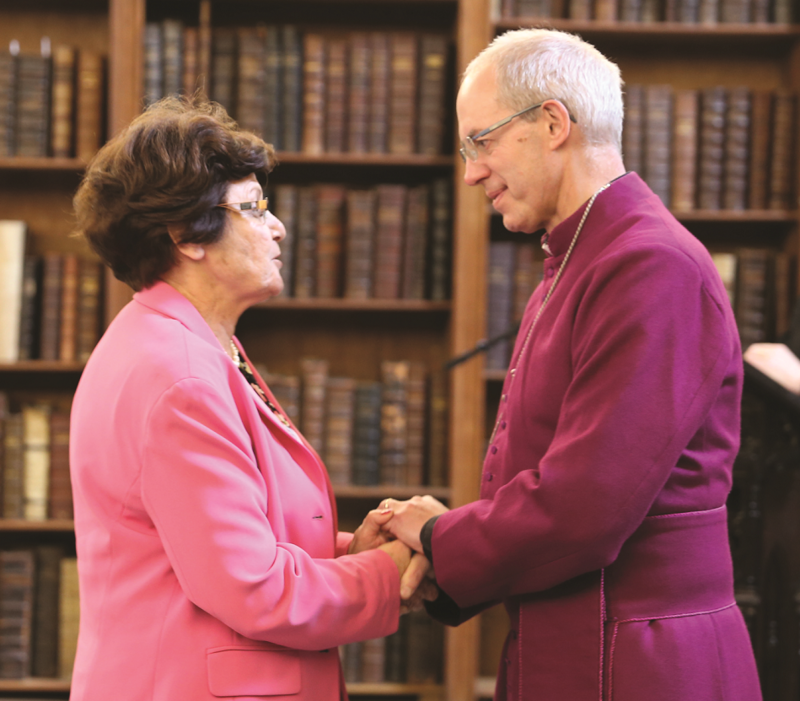 In June, she was awarded the Langton Award for service to the Community by the Archbishop of Canterbury, Justin Welby, at a ceremony at Lambeth Palace in the United Kingdom. In presenting the award, Archbishop Justin noted that Suhaila’s “outstanding service to the community has been carried out in one of the poorest and most neglected corners of the world. She has guided the provision of vital medical services with a calm grace”. Typically, Suhaila was quick to note that this is not an award just for herself but also for the whole hospital team, and for the long-term partners such as Anglican Overseas Aid. Suhaila Tarazi, we salute you and are proud to work with you to alleviate the suffering of so many women in Gaza. For outstanding service to the community in one of the poorest and most neglected corners of the world, overseeing with a calm grace, the provision of vital medical services at the Al Ahli Arab Hospital, Gaza. Suhaila Tarazi has worked in Gaza since 1987 as the Director of Al Ahli Arab Hospital. The difficulties faced by Gazans are well known and documented. Gaza is cut off from its neighbours by fences, walls, and a sea blockade. Access to health care is vital to the community and this is provided by Suhaila and her dedicated staff in the most trying circumstances. An example of the difficulties in which they operate was evident in 2014 when, among other things, shrapnel damaged the hospital, power was cut and supplies were severely curtailed. Medical services during such crises are vital. Suhaila continued to lead her staff with courage and compassion, even when the world around her seemed to be collapsing. Another example of how difficult life at the hospital can be for patients and staff, is through the actual provision of medical care. A cancer patient, for example, has to apply for a permit to exit Gaza to receive treatment in Jerusalem. This can take many days to be granted. Under Suhaila’s leadership – and through her charismatic engagement with donors – she has recently had a mammography unit installed, as she is aware of the importance of early diagnosis if the medical needs of the Gazans are to be met.